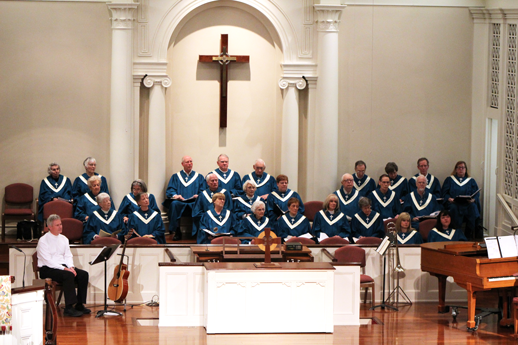 The choir and musicians of Hendersonville Presbyterian Church will present Part II of “A Walk through the Bible,” in their sanctuary on April 18 at 6:30 P.M. he script for “A Walk through the Bible” was written by Brenda Bradshaw in the year 2000, when a choir member, Ray Wissolik, suggested to director of music, Gayle Stepp, that she compile a list of choral anthems which would tell the entire story of the Bible from Genesis to Revelation. Always interested in creative opportunities, Gayle pulled together some anthems and asked Brenda Bradshaw to write a script. This resulted in a presentation a storyteller narrates, as scripture and music enhance the sharing of the great truths within the Bible. Gayle and Brenda have worked together to present this musical three times previously, each time, changing and adapting the music, with the script remaining the same. The Old Testament, Part I was presented on Ash Wednesday, and The New Testament will be presented on Maundy Thursday. The presentation will include liturgical dancers Tarelton Brooks, Bronlynn Spindler, Judy Van Waggoner, and Denise McDorman. Choir anthems include: “Every Valley” by John Ness Beck, “When I Survey the Wondrous Cross” arranged by Hal Hopson, “Ye Shall Be My Witnesses” and “God Shall Wipe Away All Tears,” by Jerry Kirk. Soloists include Cindy Leonard singing “More Than Wonderful” by Lanny Wolfe, and a vocal echo, “My Soul Magnifies the Lord” by Benjamin Harlan, and a duet “I Know That My Redeemer Lives” arr. by Betsy Lee Bailey” will be performed by Cathey Gilbert and Rena Johnson. Instrumentalists include: Kathy Guice Reid on clarinet, Grant Sitler on trombone, and Ron Lee on percussion accompanied by Gayle Stepp on organ and piano. Brenda Holmer will perform “Lord, I Want to be a Christian” on the grand piano. The congregation will join in singing “Joy to the World” and “We’ve a Story to tell to the Nations.” Pastor Tom Pitman and Rev. Bob Hicks will reveal the New Testament story with readings. The service will include Holy Communion. The church is located at 699 North Grove Street. The public is invited. All ages are welcome. An elevator is accessible at the 6th Avenue entrance. I am honored and excited to accept the position as the Director of Children’s Ministry. For those of you who do not know me, let me tell you a little bit about myself. After retiring from 28 years of teaching in public schools, I thought I was starting a life of leisure when we relocated to Laurel Park. However, upon registering my children for school, I was told by the transportation department that it was “too dangerous for the buses to go up the hill in the mornings.” At that point in time, the children were non-drivers; and I realized the dream of leisurely mornings on the deck with the newspaper was a pipe dream. I did discover that, for the first time, I had time to participate in Bible studies, prayer groups, and religious conferences and seminars. This was a precious time as I drew closer to the Lord and learned to hear His voice. A desire was awakened in my heart to work with the children, to teach them that God is real, that He is accessible, and that He is available to guide them if they will seek Him. Many pitfalls can be avoided if we can teach the children, build their faith, and give them opportunities to practice their faith. I want each child to know who they are in Christ. I want to see them turn to Him for guidance, and I want each child to develop a vital faith in God so they too can shine a light in the darkness. Consider this—there is no counting how many individuals a person influences or impacts over a lifetime. Imagine our little children with so great a faith that they are “sowing Jesus seeds” into the hearts of others. What an impact that could be if the children do that over their lifetime! As a member of the family in Christ, I ask each of you to join with me as we strive to equip our children with Kingdom “keys.” I know it will be an exciting adventure. I ask each of you to keep us in prayer—the children, their families, the teachers and volunteers who work with the children, as well as me, as the director. Thank you so much for your faithful prayers, your love, and support. I pray the blessings of our Lord Jesus Christ will abundantly fill each of your lives. The Holy Land Tour scheduled for April 29 - May 9, 2019 with Pastor Bill has been cancelled. It has been nearly 18 years since Lin and I moved into town in January of 2001, and began serving as your pastor on the first Sunday of March. What a wonderful time of serving and growing together with you it has been! We have loved every year of it. Recently, God has been stirring my heart and calling me to take steps toward leading the ministry of Scripture Awakening. I’ve been developing the Bible study component of this ministry for the past thirty years. The aim of Scripture Awakening is to help people, small groups, and entire churches read (Bible in 90 Days), study (BNext resources), and live (Beyond Words Radio) the Scriptures. The ultimate goal is for more Christians to become biblically literate, bringing an awakening in their lives for God’s glory. I am praying for the nation to experience an awakening. I am also hoping to complete various writing projects I’ve had on hold. I brought my sense of call to the session, and they deliberated long and hard, with the help of Presbytery, and finally initiated the process of seeking an interim (transitional) pastor. On Sunday, February 3, I will pass the mantle of leadership to our transitional pastor. This is a difficult transition for me as I have so much loved serving as your pastor. The good news is that the Presbytery and our session have allowed for Lin and me to continue worshipping with you all indefinitely. We will be designated as missionaries of the church. We will continue as your friends and fellow servants of HPC. We have been through a lot together: the renovation of the sanctuary, a transition out of the PCUSA and into the EPC, coming to settlement on and paying off our property, and the beginning of a visioning process to become a more focused and “simple” church around the Great Commission. Until now, with so much ongoing change, I would not have felt comfortable leaving you. Now, however, the timing seems perfect for a transition into new pastoral leadership. Timing does not make it easy, but it makes it right, along with the clear call of God. Lin and I are excited about what the Lord has in store for Hendersonville Presbyterian Church, as well as in the mission of Scripture Awakening to which you are sending us. All glory to our Lord. For the past 18 years, Pastor Bill has shepherded the body of Hendersonville Presbyterian Church (HPC) well. Over the last decade, he has faithfully guided us through the wilderness and into the Evangelical Presbyterian Church (EPC). He has prepared us for the next chapter of our faithful walk with Christ. For all that he is in Christ, for what Pastor Bill has done for the Kingdom of God, for his teaching and preaching, we are grateful. Now the Lord is calling Pastor Bill to a new life of service with Scripture Awakening, the scripture reading ministry he founded and is located in Hendersonville. We release him to this new call as a missionary of HPC with great joy, though with much sadness. We will miss him as our pastor. Unlike the ending of most pastorates, Bill and Lin will remain among us as worshippers. Furthermore, the Session has voted to include Scripture Awakening as one of the ministries our church supports. Please pray for them as they are step out in faith on their new journey. Change can be very difficult, but it can also be exciting. Bill is not leaving the pastorate under negative circumstances or in controversy. It was his choice to leave, not ours. It was not an easy decision for him to make as he loves us, and we love him. As we enter this new season, let us remember what he has taught us and continue to lean upon the Holy Spirit for our strength and support. We are anticipating that a strong Transitional Pastor from the EPC will join us during the month of January with Bill’s last day being January 31st. A Transitional Pastor is an experienced pastor who has been specially trained to prepare us for our next senior pastor. We know that you will support and love the new pastor as you have Bill. We urge you to continue to support the church with your prayers, service, and finances. Your Session will continue to keep you informed as we transition into this new leadership. We are blessed to have a strong church staff and ministry team to guide us. Remember that we do not go alone through this season. The Lord will be with us as we seek first His Kingdom and His righteousness to lead us. Let us rejoice with love and gratitude for the years of devotion Bill and Lin have given us in service and look ahead to what the Lord is going to do in us and through us in the years to come. Please come to the Table Talk on Wednesday evening, December 12 to ask questions and hear about the process Pastor Bill and the Session went through to discern God’s leading and calling.